tapestry of flavor “from the reign of William IV, before Big Ben and Tower Bridge where built… from a London of great wealth and poverty, where beer was brewed in huge quantities as an alternative to the untreated and filthy waters of the Thames.” It did not disappoint. The mild poured a hazy copper orange with an aggressive taupe head that faded elegantly as I drank. On the nose was malt. Lots of malt. Sugar cane, maple, and yeast with a subtle undertone of bananas foster. On the palate danced balanced flavors of caramel, sun-dried fruit, barleywine, and a host of notes that I couldn’t begin to place all against a strong-spined backdrop of ethanol and oak leaves. My winter-weary bones absorbed the warm, crisp goodness and all was right in the world. I put it to you, Baroness: when a brewing outfit combines primary research with unorthodox brewing methods to create a wonderful, pleasing libation whose flavors are nearly impossible to articulate… does that brewery a project make? I think so. A 3.5 hop offering from a terrific brewery pursuing, yes, a worthy project. Paquette dedicates his mild to the unknown brewer who first made it. Little doubt that the mystery man behind this mild is smiling somewhere and toasting the return of a great brewing tradition. Posted in Ale Factories, Tasting Notes.Tagged Campaign for Real Ale, Dann Paquette, Mild Ale, Once Upon A Time, Pretty Things Beer and Ale Project, The Alan Parsons Project. Fantastic post, Baron. 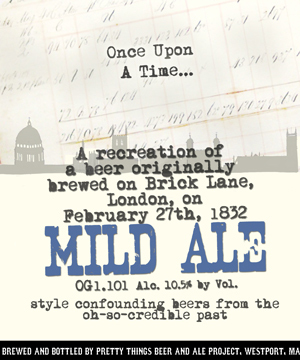 One of my very first contributions to the Aleheads domain was on session beers (https://aleheads.com/2010/02/19/a-brief-session-on-session-beers/) and after a brief Maltercation on the subject we all agreed that Milds were the quintessential session beers. The Milds we spoke of were the lower gravity variety, in fact, I had no idea that a Mild could be as stout of heart as this offering. Great education all around, nice work! And thanks to Ripped for sending one of these my way. Wifey McHops and I cooked up some coriander-crusted chicken with mashed cauliflower and washed it down with this beauty. Pretty Things knows their stuff and then some.